Rock-cut Elephant at Dhauli: Dhauli is located in the ancient territory of Kalinga, now the state of Orissa, which the emperor Ashoka Maurya (reigned 272-231 BC) conquered with appalling loss of life in about 260 BC. 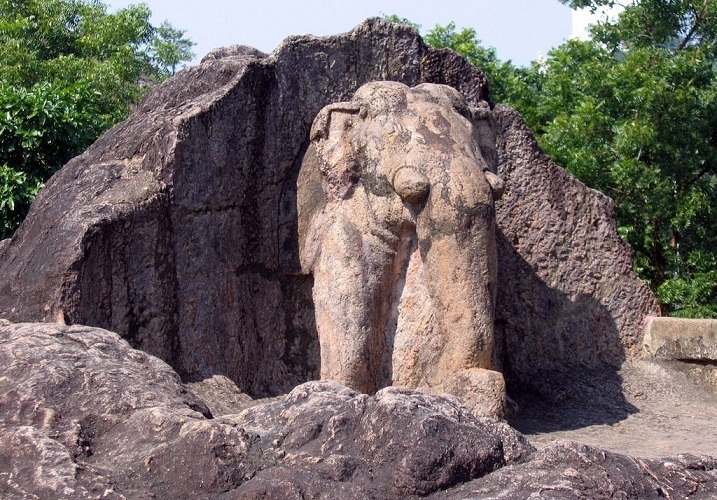 Rock-cut Elephant at Dhauli is one of oldest monument which sculpted elephant faces east. The prime Buddhist attraction of Dhauli are the rock edicts of the Indian emperor Ashoka. These rock edicts are on the northern face of the southern range and primarily carry instructions for local administrators to rule with gentleness and justice. The inscription on the edicts read : '...these are my instructions to you. You are in charge of many thousands of living beings. You should gain the affection of men. All men are my children, and as I desire for my children that they should obtain welfare and happiness both in this world and the next, the same do I desire for all men...'. Immediately above the inscription is a terrace, on the right side of which is a forepart of an elephant. This forepart has been sculpted out of a solid rock and is widely believed to be one of the oldest carvings in India. In Buddhism, elephants are quiet often, linked with the Buddha, either as a form in which He enetered His mother’s womb or as the sacred symbol of Buddhism itself. The sculpture of elephant, here therefore, is an object of venration. This elephant sculpture also aids in drawing tourists attention to the inscription itself.